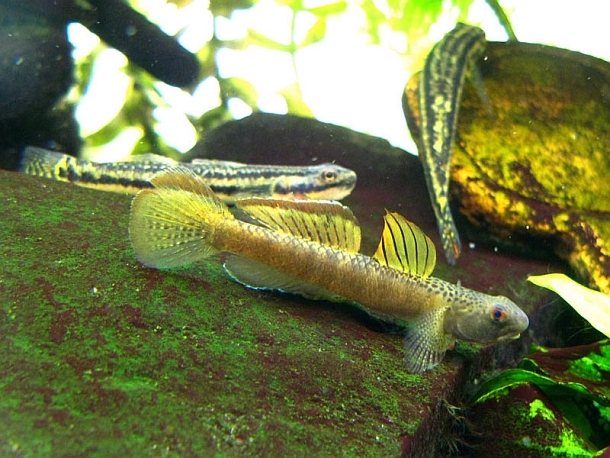 Freshwater gobies of the genus Stiphodon have become increasingly popular aquarium inhabitants in recent years, but considerable confusion has surrounded the identity of some commonly-traded species due to a number of factors. These include taxonomic uncertainty with some species closely resembling one another, a lack of literature, incorrect labelling by exporters and shops with males and females often sold separately, mixing of species at export facilities, absence of collection data, and the likely trade of undescribed species. A number have been named since the turn of the century and the latest is a popular fish which has previously been referred to as S. sp. ‘orange fin’, S. sp. ‘ST01’, or misidentified as the congener S. zebrinus Watson, Allen & Kottelat, 1998. S. maculidorsalis Maeda & Tan, 2013 can be told apart from congeners by the following combination of characters: usually 9 soft second dorsal-fin rays; 15 soft pectoral-fin rays; first dorsal-fin in male pointed with spines 4 and 5 elongate; tooth-counts relatively high (42-46 premaxillary teeth in specimens <30.0 mm SL; 51–56 in 30.0–39.9 mm SL; 52–59 in 40.0–49.9 mm SL; 64–65 in ≥ 50.0 mm SL); dentary with canine-like symphyseal teeth in both sexes; no white patch behind pectoral-fin base in males; anterior half of nape almost naked in male; most of nape scaled and most of occipital region naked in female. The colour pattern also displays elements unique within the genus including presence of small black spots on the dorsal surface of the head and trunk in both males and females, broad black bands on the distal portion of the second dorsal-fin and dorsal segment of the caudal-fin in males, fine black spots on the pectoral-fin rays in males, and dusky transverse bars laterally on the trunk and caudal-fin in females. It’s native to Bengkulu and Aceh Provinces in Western Sumatra and the description, published in a recent issue of ‘The Raffles Bulletin of Biodiversity’, forms part of a review of the genus in that area. 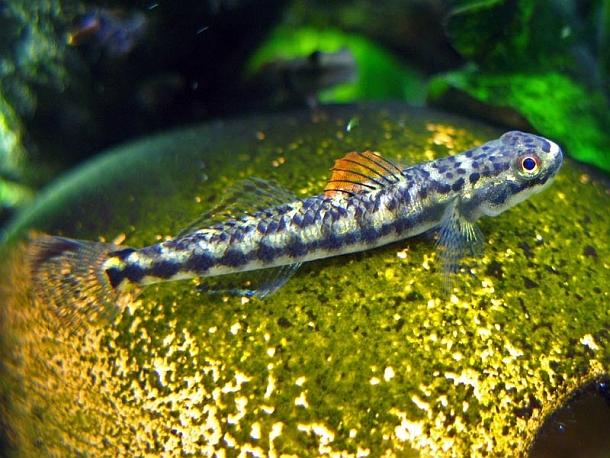 The authors note that Western Sumatra appears to represent the primary source of Stiphodon gobies in the aquarium trade, with over half of the specimens used in the study obtained from the aquarium trade in Singapore. Among them were two other species, namely S. semoni Weber, 1895 and S. ornatus Meinken, 1974, and the latter appears to be the fish that has long been known to aquarists as S. sp. ‘rainbow’, S. sp. ‘gold fin‘, S. sp. ‘gold cheek’, or S. sp. ‘ST02’. It’s also been misidentified as S. elegans (Steindachner, 1879) in the past and there has been considerable speculation regarding its identity with no general consensus reached. One would suppose that the fact the aquarium fish are collected in Western Sumatra should be significant in the latter respect because the known range of S. ornatus does not overlap with any similar-looking congener, but this is not the end of the story. In particular, there may still be more than one species involved with a smaller, near-identical variant traded under the same names, and males of both ‘forms’ can also display a remarkable amount of mood-dependant colour variation. 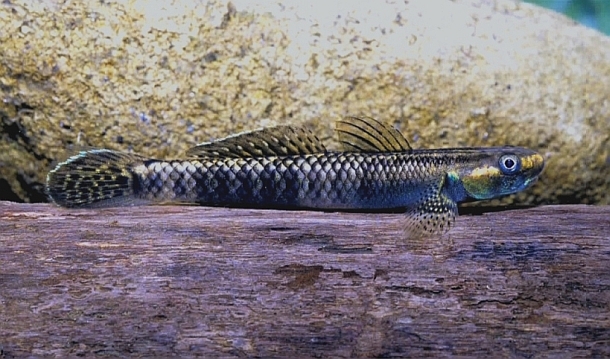 In addition S. ornatus closely resembles the congeners S. atratus, S. imperiorientis, S. martenstyni, S. pelewensis, S. pulchellus, and S. weberi and little information is available regarding live colouration, morphological differences and their phylogenetic relationships, problems that are unlikely to be resolved unless an exhaustive study is carried out. The riddle is thus only partially solved, but for the time being we list all the similar-looking fish from the aquarium trade together since principal author Dr. Ken Maeda was kindly able to identify “most” of those pictured as S. ornatus. 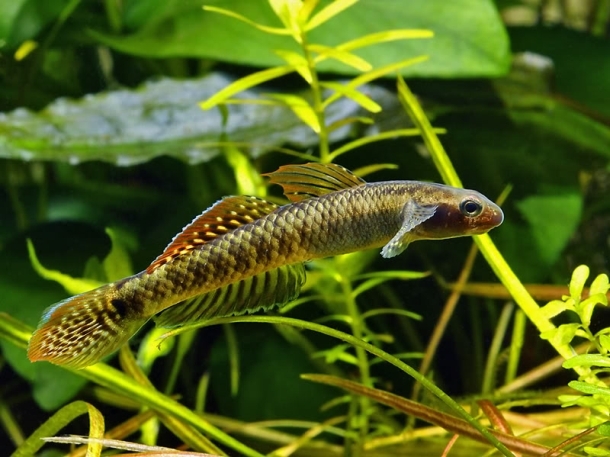 It’s also worth noting that all Stiphodon species in the aquarium trade are wild-collected and concerns have been raised regarding their conservation status since some are locally endemic and may already be threatened by habitat degradation, pollution or introduction of exotic species such as tilapia. Special thanks to Ken Maeda.